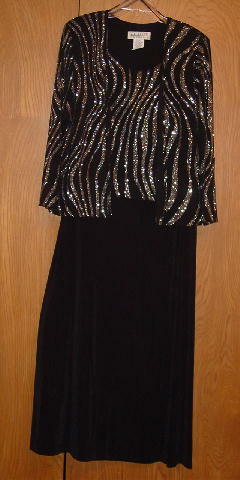 This eye-catching jacket and long dress were made in the USA by J.R. Nites Woman and are 95% polyester and 5% spandex. 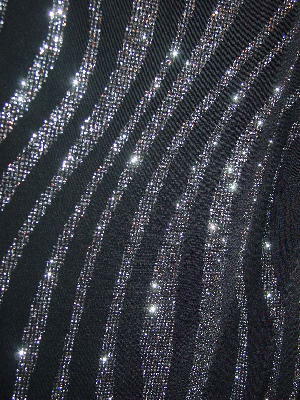 It has a black background with a silver metallic glitter freeform line pattern. 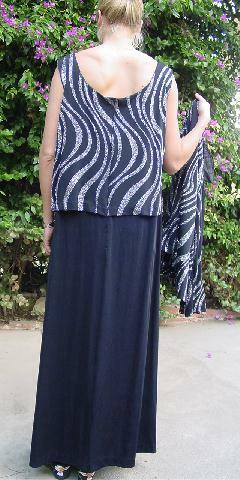 The dress is sleeveless and has a deep 15" wide scoop neckline. The bodice (blouse effect) moves freely in the front and sides and is attached to the underdress in the back by the zipper. 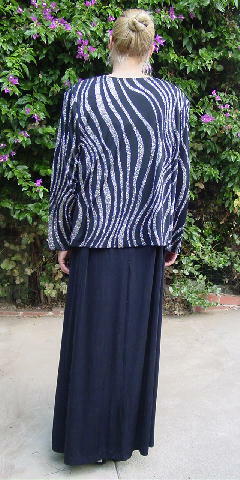 The underdress has a different fabric texture in the area covered by the outer glitter "blouse" which hangs 4" lower. There is a 17 1/2" long back zipper. The matching jacket has shoulder pads and long sleeves. It really sparkles in person. The tag says size 18 W.
She wore it to the Academy Awards show. 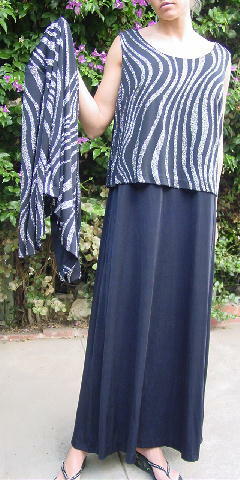 shoulder to "blouse effect" bottom 22"
shoulder to (skirt) hem 57 1/2"
bottom hem side to side 36"
armpit to armpit 22 1/2"